Hen in a Hurry is a Chef Prepared Meal Subscription service. All food is made with clean, sustainably sourced, responsibly raised ingredients from trusted farmers and purveyors. There is no waste, prep, or preservatives. Instructions are simple heat and serve. You can either do microwave or oven. All subscriptions are no commitment, you can cancel at any time. My opinion: My box arrived on schedule. I worried as it was pretty warm out and didn't want anything to be thawing out. The box it arrived in was a very sturdy Styrofoam box, which I re-purposed into a foot stool. Everything was packed in nice and neat with plenty of dry ice. All food was frozen solid still. I would have nothing to worry about even if it had to sit on my porch until I had gotten home that evening. Each food item was labeled and had the cooking instructions as well as the ingredients listed. Which you can see that each item is very simple and no added junk. I tried to do both cooking methods so I could see how well they did. I am normally someone who doesn't use the microwave often, as I fear things won't come out as well. I cooked the Taco Bake in the microwave and it was delish. This was one of those meals I picked out that I normally wouldn't eat. This is made with quinoa, which I had never tried before. The kids and I were both in love. It actually makes us want to eat more things made with it. The enchilada bake was just as yummy. Once again cooked in the microwave. I did find that maybe my microwave wasn't as strong as the directions were aimed for. I had to cook it about a minute or so longer in order to get it cooked all the way to the center. The kids insisted that the Approved Mac and Cheese was actually eggs. It did not taste like mac and cheese, however it did taste like eggs. My kids insisted that it was eggs, however they all ate it and enjoyed it. 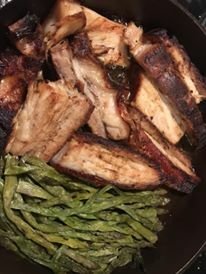 Our favorite meal, by far, was the Bourbon Braised Pork Belly and Asparagus. This too was another meal we had never eaten before. I did this one in the oven. I put both the meat and the asparagus in a cast iron skillet and baked it all together. There was not one drop left after dinner. Everyone had full bellies and big smiles. Overall I think this is one of my favorite subscription food services. Not only does it have healthier foods, it is cost-friendly. There is no prep with this either, so it is quicker to cook and go for a busy day. The foods are kid-friendly as there wasn't anything my kids didn't eat! That is a huge win at my house. I loved that they sent a list of ways to re-purpose the shipping box, that's how I came up with my foot stool idea. We also made smoke with the left over dry ice in the box too. You know since it was Halloween time :). I do believe if you or your family needs a quick meal to go, this is right for you. Maybe even a great idea to get some of your elderly family as a Christmas gift! They would love the ease of cooking and still have some great tasting food. Hen in a Hurry www.heninahurry.com Chef Prepared Meal Subscription up to 45% OFF - Hen in a Hurry does Prepared Meals Delivered to Your Home or Office Click the coupon for various deals.